Experience the Grand Canyon through amazing film and sound. The IMAX Theater at the National Geographic Visitor Center features a massive movie screen over six stories high and blasting out 12,000 watts of digital surround sound. Discover the breathtaking 277 mile Grand Canyon on this visually striking movie showing the history and impact of this jaw-dropping wonder. Soar like an eagle over the rim or feel the rush of rafting down the Colorado River. After the movie, check out the gift shop for unique memorabilia. Stop by the Canyon Plaza Resort's front desk to receive a discount coupon to IMAX upon check in. 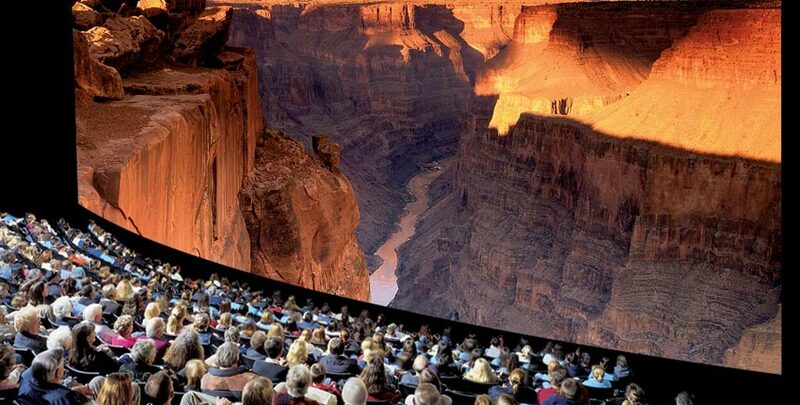 What times does the IMAX theater "Grand Canyon - the Movie" play? During the summer months of March through October, the movie plays from 8:30am - 9:30 pm, every hour on the half hour. For viewing November through February, the movie plays from 9:30 am - 6:30 pm, every hour on the half hour. The movie is 34 minutes long. What will i learn by watching the movie? "Grand Canyon - The Movie" takes you on a journey to learn about the formation and impact of the Grand Canyon. A giant six-story screen and over 12,000 watts of digital surround sound lets you really experience the Grand Canyon, throughout time. Experience the history of the Grand Canyon with stunning visuals, thrilling filmed adventures and realistic sounds and the sensations made possible by IMAX® technology. Marvel at the amazing scenery as you feel like an eagle soaring over the rim and into the craggy canyons. Take a whitewater rafting trip down the Colorado River and sense the raging rapids thundering around you.